Will it be two in a row for the boys from Stamford Bridge? It seems like only yesterday that Chelsea beat out United on the last day of the season, while Arsenal sputtered through the last six weeks without Fabregas, and Spurs squeaked into the Champions League… pushing out the other so-called “Big Four” team all the way into seventh place. Not much should change at the top this year. For the last seven seasons, the Blues and the Red Devils have swapped Premier League honours. Can we call them the Big Two now? The newest Manchester millionaires — City — may beg to differ. Kevin: Liverpool, ManU and Arsenal just haven’t strengthened their squads to challenge Chelsea over a long season. The Blues are old, they’ve lost Ballack… but Essien is back to full fitness. Drogba is one of the best strikers in the world in Drogba. Lampard still puts out 20 goals a season. What other big clubs are getting that output from a midfielder? An experienced and settled squad who just know how to get the job done. Brent: Essien’s return will more than compensate for Michael Ballack… but the real story with Chelsea is goals. 103 of them, actually. It was a veteran squad that broke the Premier League record for goals in a season… and it was a veteran squad who shelled West Brom this weekend. Potential problem: what to do with the squad’s stable of foreign stars under new League quotas. Kevin: Ferguson has failed to fill a glowering hole in the centre of midfield. Scholes and Fletcher are good… but they’re far from world-class, and beyond them the cupboard is a bit bare. The defence is creaky with perma-crock Ferdinand and lumbering Vidic (what’s the over-under on his red card count this season?). Strength in attack with Rooney, Nani, Valencia… with Berbatov and new signing Hernandez in to give some relief. Brent: Scholes and Giggs showed this weekend that they’re not ready to hang up their boots just yet. But Giggs came off the bench, and Scholes certainly won’t start every game. Which Rooney will show up this season? Valencia should shower him with crosses… and Berbatov looks like he has something to prove. Defense is worrisome. Last year, they were the league’s stingiest. But Rio is hurt, Vidic is undisciplined and got caught looking several times last season. Good… but not good enough. Kevin: The title is a step too far for Man City at this early stage. You can’t buy a complete squad and expect them to be cohesive. Another couple of years before they are truly challengers for the title but it will come, barring any financial meltdown. You can’t spend this much money and be disappointed forever. Although Amsterdam 2001 springs to mind… but I blame that on the beer. Brent: Not cohesive, but check out the parts of the sum. City poached other supposed “big clubs”, offering untold riches to those who came to Manchester proper. But who will see the pitch on a regular basis… and who will see the back of Mancini’s fine Italian coif? Besides, the manager used three holding midfielders on Saturday and three forwards, begging the question: who will feeding the ball to the attack? Shades of Maradona… which worked out well for Argentina, didn’t it? Kevin: It’s hard not to like Arsenal unless you’re a yiddo. Their fluid attacking football is the closest thing English football has to Barcelona. But Arsenal’s downfall is Wenger’s reluctance to open the purse strings and buy some bloody players. He needs a decent goal keeper and a quality center-back to partner Vermaelen before they can challenge for the title. Arsenal are being fiscally sensible and and paying off debts from the new Emirates. But Arsenal fans must be tearing their hair out, knowing that until the debt is paid, they’re forever the bridesmaid and never the bride. Brent: Arsenal looked ordinary this weekend at Anfield. Almunia is, well, Almunia… and they lacked the flowing football they’re known for. Their two best players — Fabregas and Van Persie — are perpetually hurt… and Fabregas doesn’t even want to be there. Arsenal were in the title hunt last season until Fabregas picked up an injury in the last six weeks, and I don’t see his replacement yet. Wenger’s only edge may be in the new league quota rules, due to his long-standing policy of scouting young players. But I don’t think they will be playing in the Champions League next season. 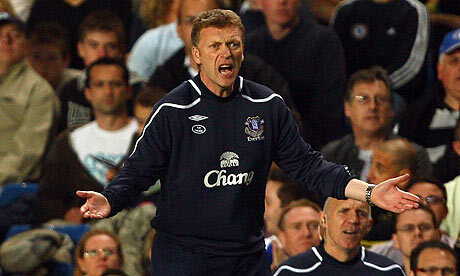 Kevin: David Moyes might be the best manager in the Premiership. Despite dealing with a lot of injuries and poor early form, Everton still managed to finish two points behind Liverpool. With more luck this year, I think Everton can push on. They have a solid settled side that are just hard to beat, and with Cahill fit they have a match winner on any given day. Brent: The Prem’s third-longest lasting manager, Moyes can wring the best out of his players. After an awful start to last season, Everton were among the best after Christmas: only Chelsea and Man U had better records. But they are still a small squad and can’t seem to sign anyone. They will fatigue and drop off, as better teams push for the finish line. Kevin: I like this Spurs team a lot. They have flair, creativity and one of the best goalkeepers in the Premiership. If they get past the Young Boys (and that’s never easy: ask my uncle! ), they’ll be fighting on four fronts and I think it will be a stretch too far. They have a big squad — thanks to their massive spending in the last few years — but I think inexperience will tell and the Champions League will affect their league results. Brent: No one expects Spurs to win the Champions League. But everyone on this North London team expects to be back in it next year. ‘Arry hasn’t signed anybody (except for Sandro?!?) but Tottenham has a solid and offensive-minded starting eleven. If they can get some super-sub performances from Keane, Pavlyuchenko, dos Santos and Palacios — along with regular displays from Defoe, Crouch, Bale, Lennon and Huddlestone — look out. Let the kids play in the cups… these boys have gotten a taste and they like it. Kevin: I’m going to stick my neck out here and predict another season of struggle for Liverpool. Unless the Chinese take-over is imminent and Roy has oodles of Yen to spend, I just can’t see them being better than last year. I know the Scouse fans are optimistic but I just don’t like their side. They are a Torres injury away from trouble. He is the class act in a workmanlike team. Brent: Liverpool were not that bad last season. Their defence was top-notch: only Chelsea and Man U allowed fewer goals. But off the pitch, the team was in turmoil and on the pitch, they relied too much on Torres and Gerrard. Worse, the team only scored 15 times away from Anfield. Hodgson has done some nifty little bits of business, bringing in Joe Cole and a cast of others. But this is not a squad of title winners… and other teams are catching up. Liverpool pride will return this season… Liverpool’s form might not. Kevin: Martin O’Neill transformed Villa into perennial contenders for Europe. They have finished 6th for the last three seasons. But O’Neill has gone, the coffers are bare at Villa Park and Milner has to be sold before acquisitions are made. The team has a huge wage bill and must trim their ranks, but they can’t unload those players to create some wiggle room. I think this will be Villa’s worst season in a while. Brent: Saturday’s 3-0 victory over West Ham must seem like a cruel joke to Villans. Wantaway Milner scored the final goal, showing why he would (will?) be missed in the Midlands. But Villa is not known for its goal-scoring and their huge wage bill doesn’t make up for their shallow squad. They are playing without a manager… with his replacement rumoured to be the biggest court jester in all of football. It might be generous to pick Villa at eighth, when all is said and done. France: Although they are officially unseeded at this World Cup, the French will be the favourites in most people’s eyes. Hand of Henry aside, the French are too deep in talent at all positions to be written off so swiftly. Speedy, technically gifted, and boasting a proven pedigree of world class players, if the French can come together in the group stage, they can give any team in the competition a run for their money. Uruguay: The absolute last team to qualify for the World Cup, they edged out Costa Rica on aggregate in a playoff. This team may be one of the more entertaining ones to watch, as they are strong up front and weak at the back. Goals should not be a problem for the South Americans, as they possess one of the most leathal strike partnerships in the tournament, with Diego Forlan of Atletico Madrid and Luis Suarez of Ajax combining for over 50 goals this season. If they can get their defence organized, this team may be the surprise of the early rounds. Mexico: Perennial underachievers, the Mexicans will once again be a tough opponent for anyone. With a population of over 100 million and a passion for football that is second to none, it is amazing that the CONCACAF powerhouse has never progressed beyond the quarterfinals. They, like Uruguay, possess a strong set of strikers, such as premier leaguers Carlos Vela (Arsenal) and Guillermo Franco ( West Ham). Rafa Marquez of Barcelona will once again be called upon to anchor the defence (although he may be deployed as a holding midfielder as well). Time will tell if this is finally Mexico’s time to break through. South Africa: The hosts can count themselves unlucky to be drawn into such a tough group. A poor showing in the recent Africa Cup of Nations tournaments does not bode well for them, but with over 60,000 people willing them to victory at every game, this team will not roll over easily. They are more than capable of emerging from the group.